Roger Angell, acclaimed New Yorker writer and editor, has produced a compendium of writings that celebrate the view from the tenth decade of his richly lived life. It’s a delicious, bracing stew of topics (friendship, fox terriers, loss, literature, baseball, marriage, ageing) and of forms (essays, letters, verse, blog posts). His wide-ranging curiosity, razor sharp memory, and prose that sparkles, hums, tickles, and envelops, fill this book with warmth and unexpected delight. What stands out in all these pieces is gratitude. Angell is unfailingly kind and grateful for the many gifts he's been given. Anyone who reads this book must be grateful for him and his extraordinary talent. Roger Angell, the acclaimed New Yorker writer and editor, returns with a selection of writings that celebrate a view from the tenth decade of an engaged, vibrant life. 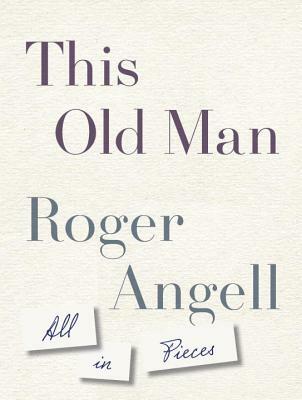 Long known for his range and supple prose (he is the only writer elected to membership in both the Baseball Hall of Fame and the American Academy of Arts and Letters), Angell won the 2015 American Society of Magazine Editors' Best Essay award for "This Old Man," which forms a centerpiece for this book. This deeply personal account is a survey of the limitations and discoveries of great age, with abundant life, poignant loss, jokes, retrieved moments, and fresh love, set down in an informal and moving fashion. A flood of readers from different generations have discovered and shared this classic piece. Angell's fluid prose and native curiosity make him an amiable and compelling companion on the page. The book gathers essays, letters, light verse, book reviews, Talk of the Town stories, farewells, haikus, Profiles, Christmas greetings, late thoughts on the costs of war. Whether it's a Fourth of July in rural Maine, a beloved British author at work, Derek Jeter's departure, the final game of the 2014 World Series, an all-dog opera, editorial exchanges with John Updike, or a letter to a son, what links the pieces is the author's perceptions and humor, his utter absence of self-pity, and his appreciation of friends and colleagues--writers, ballplayers, editors, artists--encountered over the course of a full and generous life. Roger Angell is a senior fiction editor and a longtime contributor with The New Yorker. His writings for the magazine include reporting, commentary, fiction, humor, film and book reviews, and, for many years, the magazine's Christmas verse, "Greetings, Friends!" His ten books include such baseball writings as The Summer Game, Five Seasons, and Game Time, and, most recently, a memoir, Let Me Finish. His awards include a George Polk Award for Commentary; the Michael Braude Award for Light Verse, presented by the American Academy of Arts and Letters; a PEN/ESPN Lifetime Achievement Award for Literary Sports Writing; and the J. G. Taylor Spink Award, the highest honor given to writers by the Baseball Hall of Fame. His New Yorker piece "This Old Man" won the 2015 prize for Essays and Criticism awarded by the American Society of Magazine Editors. He is a member of the American Academy of Arts and Letters. Mr. Angell lives in New York and Maine.